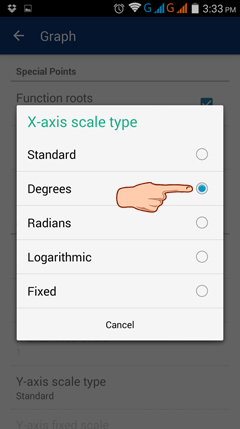 To change the scales on the x- and y-axes to degrees or radians, tap the menu button then go to Settings > Graph > X- or Y-axis scale type > Degrees or Radians. The default x- and y-axes have fixed scales in multiples of π/4 for radians and multiples of 45º for degrees. To change the scale, pinch or stretch the graph in the Graph workspace.